INTRODUCING THE WORLD'S FIRST BUSINESS MANAGEMENT PLATFORM. With Domo, it’s easy to see the information you care about in one place and use it to make faster, better‑informed decisions. INSTANTLY CONNECT TO ALL YOUR DATA. BRING IT TOGETHER IN ONE PLACE. Domo makes it easy to see the information you want, how and when you want it. Anyone—from CEO to contributor—has the ability to discover, mash up, visualize, and present data any way they’d like. So whether you’re wanting to see marketing’s contribution to sales or manufacturing’s labor cost per unit, the information you need is always at your fingertips. EMPOWER EVERYONE TO MAKE BETTER DECISIONS. Today’s BI solutions and dashboard tools are designed to empower data analysts and decision-enablers. 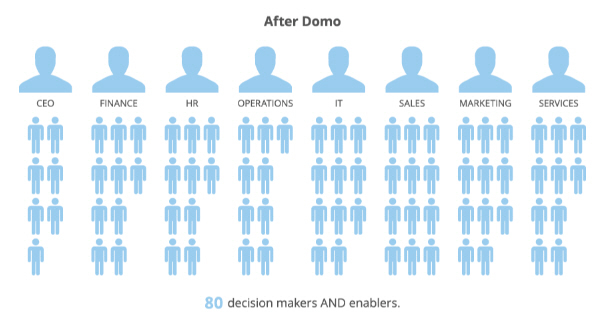 Domo is the first solution designed to empower everyone in the organization—including non-technical business leaders that drive decisions.